This fragment is part of a single slab to which also the relief n° Scu 2004 belongs. It depicts part of a male character with his head turned to the right and short, curly hair. The man, with youthful features, is clad in a cloak (chlamys) and holds a knotty staff, called pedum, in his left hand. 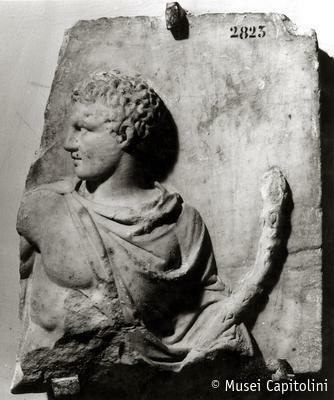 This marble, found on the Esquiline hill, probably portrays an Auriga (charioteer) who is holding in his right hand the bit of one of the horses of the chariot of the relief n° S 2004.